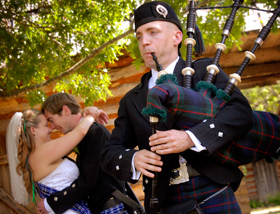 Whether you boast Scottish ancestry or not, the Great Highland Bagpipe makes a wonderful addition to a wedding ceremony. The volume of the pipes will easily fill the hall or church, and the sound carries beautifully outdoors. Matt would be happy to discuss with you any of the many ways to include the pipes in your ceremony, whether for the procession of the bride, the recession of the new couple, or any other moments that the bride and groom may wish to make a musical statement. Call or text at 972-657-0318 or send Matt an email for ideas on how you can incorporate the pipes into your special day. The passing of a loved one is always a difficult time and Matt takes great care to approach each service with the dignity and respect your family deserves. Matt ensures the details are correct, from the tuning of the pipes to his professional appearance and attire. He can perform at the church or funeral home, or at the graveside, or at both locations if that is the family’s wish. Call or text at 972-657-0318 or send Matt an email for a brief consultation on how you can incorporate the pipes into your service. Matt has played for a wide range of events, from retirement ceremonies to birthday parties. Whether the event is joyous or solemn, the music of the pipes can be a wonderful addition to the day. Call or text at 972-657-0318 or send Matt an email for ideas on how you can incorporate the pipes into your event. Matt has many years of recording experience, including Rathmore’s latest EP Mooncoin, as well as three studio albums with The Killdares. He has been featured with a number of other recording artists and organizations such as Heather McCready, Floramay Holliday, and Gateway Church. Matt is also proficient on the Irish penny whistle and uilleann pipes, so whatever Celtic sound you want to add to your recording, he can deliver. Please Call or text at 972-657-0318 or send Matt an email with any questions about featuring Celtic instrumentation on your recording. Matt is courteous, professional and reliable. We’ve had several members hire him for Memorial Services and he’s always done an excellent job! We hired Matt to play at valet for a very special wedding at the Fort Worth Modern. The groom had an Irish background, so we thought this would be perfect for the occasion. Matt was so amazing and played beautifully! I can’t wait to work with him again!! He was very easy to work with and he is very reasonably priced. We are looking forward to working with him again! We hired Matt to play the bagpipes on a single we were producing at Spaceway Productions. He arranged and recorded the part at his home studio. We were extremely pleased with his performance, engineering, and professionalism. Would definitely recommend him to anyone looking to add bagpipes to their music! Matt played for our daughter’s spring wedding this year. He was professional and so easy to work with. He gave song suggestions that were perfect for the wedding! Many of our guests commented on how Matt’s piping added a special element to the night, even bringing tears to the eyes of some of our Irish guests – and the bride!! I highly recommend Matt for any event!! Matt is absolutely terrific! In addition to being a great player, he is easy to work with, affable, punctual and everything else you’d hope for when hiring a professional musician. We have had Matt lead our Palm Sunday parade at First Presbyterian Church of Dallas for the past several years and he has quickly become a huge part of the success of that event. I can’t recommend Matt highly enough. If you’re looking for a piper- you’ve found the right one!